Death in the Ice — The Mystery of the Franklin Expedition tells the story of Sir John Franklin’s tragic final voyage, which set sail from England in 1845. Museum scenographer Kerry McMaster Wassenaar led the team responsible for designing the exhibition space, a crucial part of the storytelling process. In this post, she describes how the team depicted life aboard the Expedition’s two vessels, where Franklin and his men spent many long, ice-bound months. She also recounts the challenges involved presenting an Expedition ship within the exhibition space. It started with some tape on the floor in an office, where exhibition curator Karen Ryan had laid out some of the cramped spaces on HMS Erebus and Terror. She was looking for a way to show visitors just how small the spaces were for the 60-plus men who lived aboard each ship for three years. We were planning the “Life on Board the Ships” zone of the exhibition, but knew we couldn’t make an exact copy of the ship’s interior, given that it wouldn’t accommodate wheelchair access or our budget. We needed to abstract the environment while still communicating its details. We needed a place to “hang” our human story and our messages about exactly what the sailors did all day when their ships were stuck in the ice for an extended period. We did have fabulous digital versions of the original floor plans for both ships, along with several illustrations of their interiors. For some of us, that would be enough. One of my favourite books in middle school was a book of Victorian house plans. I would pore over the layouts and imagine myself in the houses. But how could we get the average visitor — someone less geeky than I about old plans — to make the leap from paper space into an imagined 3D world? 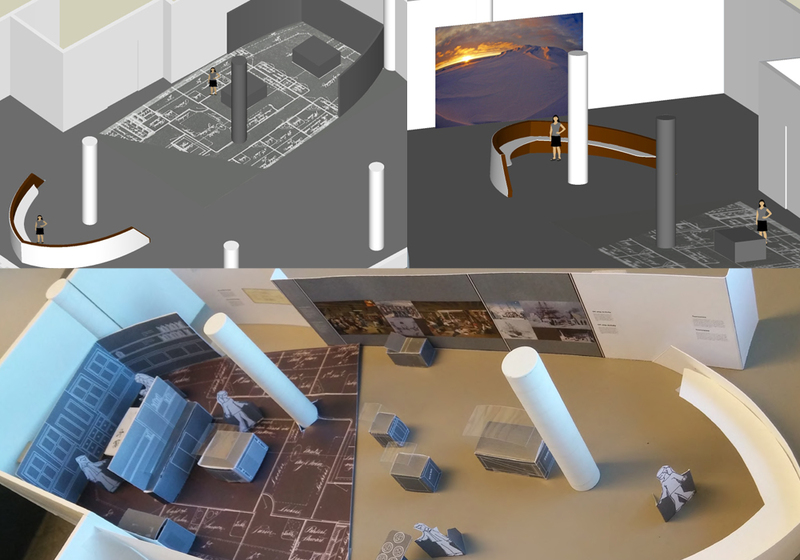 Creating an immersive 3D floor plan at full scale became the solution. We could then pick and choose which elements and walls would be represented only on the floor plan, and which elements would occupy 3D space. Thankfully, there are people out there who enjoy poring over old floor plans even more than I do. The creator of a scale model of HMS Terror had drawn vertical elevations of many of the interior spaces of the ships. This allowed us to fill in the missing vertical walls, and saved our team weeks of research. The Museum gallery is too small to accommodate a plan of the whole ship — especially since we needed to save space for the rest of the exhibition — but in an exhibition story driven by setting, I wanted visitors to have the sense of a whole ship. We needed a upper-deck bow where visitors could gaze out and understand that, while the men lived in a cramped, dark space, outside that cramped space was a vast, icy, desolate and sometimes very bright seascape. It was, ironically, the very vastness of that seascape that was ultimately responsible for their claustrophobic living conditions. Amazingly, the diameter of the columns in the gallery is very similar to the diameter of the masts of HMS Erebus and Terror, so I positioned the bow at the correct distance from the first “mast” and the rest of the show’s layout followed from there. We then needed to figure out how much of the floor plan we would show, and how we would transition from inside on the lower deck to outside on the upper deck. Karen Ryan, creative development specialist Claire Champ and I spent a lot of time putting notes on the original floor plans, seeing which spaces we needed to display while matching our messages to different parts of the ship. Usually text and content dictate graphic design. In this case, the design influenced which content could be presented, and where. Over time, it all came together. We added quotations, artifacts, audiovisual elements — and even a monkey — to fill in the story. We made the floor plan bilingual and introduced legible fonts, while still retaining a historical feel as a nod to the original plans. Ship enthusiasts who have spent time looking at the original ship plans, and those who have now enjoyed a glimpse into the wrecks, will quickly see where we guessed and where we cheated to make the whole thing work. It’s a little bit Terror and a little bit Erebus. Our team has come to refer to it as the Terrebus. We hope you will come to see it in the exhibition.